We've been great admirers of Le Typographe for many years now. This stationery and print shop from Brussels is one of our favorite local treasures and we were thrilled to be able to collaborate with its founder Cédric Chauvelot for the release of our new Saintonge collection (we’ll tell you more about this soon!). 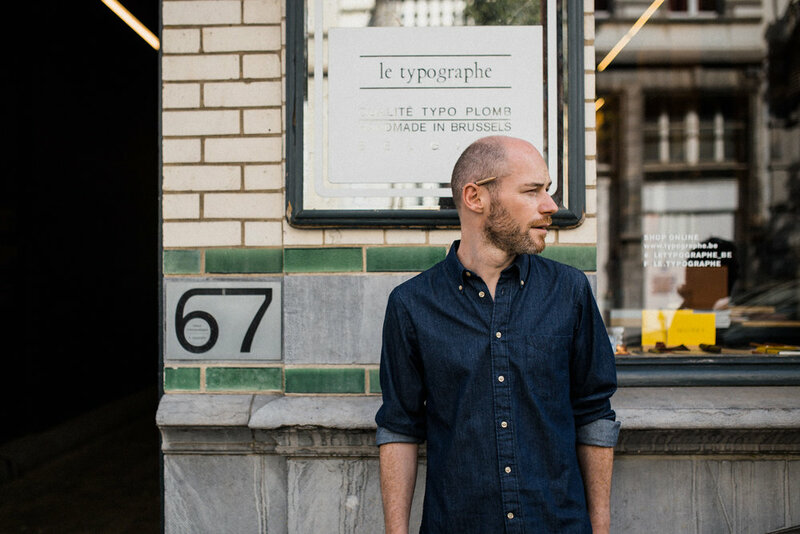 We like to call Cédric Le Typographe (The Typographer), because he is so extraordinarily dedicated to his craft and strives to be the best at what he does. 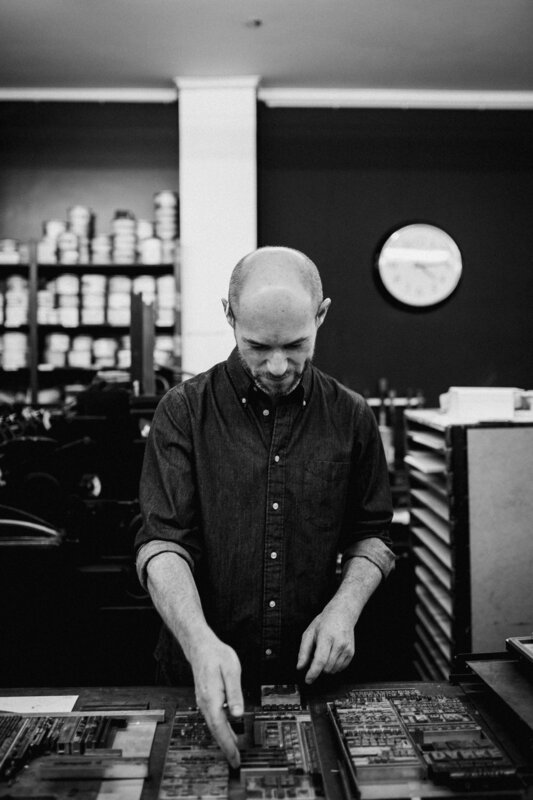 He and Bellerose share many core values, such as craftsmanship, a strong attention to detail and a passion for Japan. I started Le Typographe on a whim. I had been collecting antique lead characters and was storing them in the basement of my school. One day, the director called me and told me they needed to go. I had three weeks to collect them, so I bought a machine and started using it. We didn't have printing classes at my school, but there was a machine and a local printer would sometimes come and show us how to use it. Letterpress printing is the only way of printing I know. I think my work is successful throughout the world because the technique I use gives a very refined result. We also really care about the type of paper we use. We use colored paper, we don't only print on white sheets. This was always a distinctive sign of our work. Japan is a huge '“coup de coeur” to me. I visit Japan 3 to 4 times a year to meet with my clients and partners. I learned a lot by visiting studios in Japan. And they’ve learned a lot by visiting me here. I think we understand each other because we have the same affinity for our profession, the same love for the work, and attention for detail. I am completely obsessed with letters. As a typographer, when I walk somewhere I can’t help noticing the spacing, the readability of everything written. And because we work in such a precise way here, it got a little obsessional for me. I'm quite obsessional myself. Actually, I think my profession was made for obsessional people. This might also be why I get along so well with Japanese people. They can be quite obsessional with details as well. We design, make and distribute our products. That means we have total control over what we sell. When people shop our products, they can't really guess how much effort went into making each item. Someone buying an envelope from us can't possibly know that every single envelope we sell was glued by hand! Meeting Patrick Van Heurck was a great thing for me. We got along well immediately as we share similar views regarding the way we work. We both have an eye for detail. We worked together on the flagship Bellerose store on Place Stéphanie, redoing the ceiling for example. I like Patrick's taste a lot. He likes a lot of things I am attracted to myself. Take a crooked wooden board mounted on a wall with rusty nails: Patrick knows it could end up looking good. This is something that moves me. His taste helped me refine my own. It's not easy for me to describe exactly what I like about Bellerose, but Bellerose definitely helped me define my identity. To me, Bellerose is Belgian. A close knit of people working together. Timeless but always reinvented. I think this is what makes the brand so successful on an international level.